Australia is the popular destination favouring applicants with high skills and are having a desire to start a new life in Australia. Australia with its culturally different society & fast developing economy extends openings to all those who wish to progress and reside in the Country. The Australian economy is strong and is actively encouraging the skilled young people to lodge immigration application. Skilled candidates wishing to work in Australia will be assessed based on points set by the immigration department. The country is outstandingly attractive with a migrant friendly society. Australia has the best education and health systems. The educational amenities and the health services presented by Australia to its people are very good. Australia is certified by The World Health Organization (WHO) for having a very low crime rate, as compared to most other nations. Australia is politically stable and is one of the world’s beautiful destinations for good quality of life. The country also offer many social benefits to its people. The standard of living in Australia is comparatively higher in comparison with other countries. Also, Australia is blooming in economy wise and its growth is well reflected in it’s people’s lifestyle. Bilimoria & Associate are Immigration Consultants and specialist in visa processing based in Chennai has been providing Immigration services for Australia to many people every year from different parts of the country. As an Immigration Consultant Bilimoria & Associate offers the clients full range of immigration services that suits the requirement towards obtaining their visas. The Skilled Migration visa is one of the best opportunities for applicants to live and work in Australia. The Skilled Occupation List (SOL) and Consolidated Skilled Occupation List determines which occupations are eligible for Skilled Migration visas. The updated SOL is based on expert advice from the independent body, Skills Australia. The SOL identifies specialised occupations of high value and includes managerial, professional, associate-professional and trade occupations. The list of occupations reflects the Australian Government’s commitment to a skilled migration program that delivers skills in need in Australia. The SOL will continue to deliver a skilled migration program tightly focused on high value skills that will assist in addressing Australia’s future skills needs. The migration program is continually reviewed to make sure it is responsive to economic conditions and skills needs. In keeping with this objective, the SOL will continue to be reviewed by Skills Australia on an annual basis, ensuring that it meets the needs of the Australian labour market. An eligible applicant whose occupation is not on the SOL, but the occupation is on the CSOL then the applicant can still qualify to lodge Migration / Residence visa to Australia with State sponsorship / Nomination or Employment Nomination or Subclass 457. Under the Australian General Skilled Migration program, skilled migrant and skilled worker applicants can use their qualifications, work experience and language ability to meet the Australian immigration requirements for a permanent Australia visa. There are four main visa options through which an applicant can obtain Permanent Residence visa to Australia. Each application is assessed based on the points system set by the Immigration department for Skilled Migration visa. Points are awarded for Age, Qualification, Work experience and Language proficiency. There are different visa categories on which an applicant can be eligible to lodge his Immigration application to Australia under Skilled Migration visa. a) Skilled Independent visa: Applicants with skills in demand in the Australian Labour market as per the Skilled Occupation List( SOL) can apply on a Skilled Independent visa. In this visa category applicants must pass a points test to qualify. Applicants who are unable to meet the Skilled – Independent requirements can also opt for other visa options for which they must be either sponsored by an eligible relative living in Australia or nominated by a participating state or territory government. c) Skilled – Regional Sponsored visa: Applicants nominated by a participating Australian state or territory government (OR) Sponsored by an eligible relative living in a designated area of Australia. The above visa class is subject to the Cap and Cease arrangement that took effect on 22 September 2015. Any visa application that was not decided before 22 September 2015 will be taken not to have been made. Australia announces new points test and criteria – Expression of Interest (EOI). The new pass mark has been set as 60 points as minimum pass mark and all applications will be assessed on the new points test. The new pass mark is applicable to all applications lodged after 1 July 2012. Every application with the minimum 60 point pass mark may not be invited to lodge an application, whereas the Department of Immigration and Border Protection (DIBP) computer system will select the best of the Expression Of Interest (EOI) application and invite them to apply for lodging an Immigration application. The minimum pass mark for the new Skill Select visa subclasses 189, 190 and 489 will be 60 points. Applicants will first submit an Expression of Interest (EOI) and then be invited to make an application for these visas. 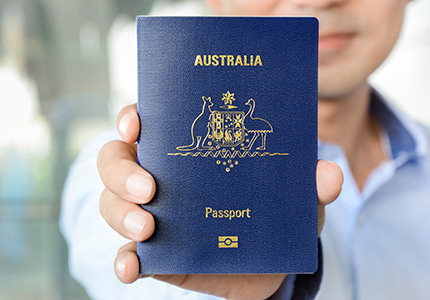 Department of Immigration and Border Protection (DIBP) advised the change to the pass mark was in the situation of the series of reforms to the skilled migration program undertaken by the Australian Government since 2008. These reforms have ensured the skilled migration program is a responsive and demand driven program and the cornerstone of this migration reform package will be the introduction of SkillSelect from 1 July 2012. SkillSelect will work and benefit applicants whose applications will be lodged through an online service that will help skilled workers who are interested in migrating to Australia. Interested candidates need to provide their details which will be taken into consideration for a skilled visa through the new system of an Expression of Interest (EOI). Eligible migrants could be nominated for skilled visas through Australian employers or state and territory governments, or can be invited by the Australian Government to lodge a successful visa application. SkillSelect is a big change to how Australia wishes to monitor its skilled migration program. SkillSelect will make sure the skilled migration program is based on the economic needs of Australia. The Australian Government will monitor who is able to apply for skilled migration, if they are able to apply and in what numbers, on the basis of this requirement. The Department of Immigration and Citizenship wants to considerably reduce on the time process of an application. SkillSelect will advise on regional skill shortages. SkillSelect will also allow intending migrants to indicate their willingness to live and work in regional Australia. Benefit to employers experiencing regional skill shortages and state and territory government is attempting to settle migrants in regional areas of Australia. The Australia's new skilled worker program, SkillSelect, allows applicants to submit an Expression of Interest (EOI) before the visa can be processed. The SkillSelect system will work as an electronic two-stage process where potential applicants first submit a request for skilled migration through an online EOI. Subsequently, SkillSelect system will select the best applicants on the basis of their EOI and then may be invited to submit an Australian visa application. Applicants will be selected to submit an application based on the points they score in a number of selection criteria. Applicants will be given points for the age, English language ability, work experience, and education. All potential applicants will be required to meet the relevant English language requirements and obtain the necessary skills assessment prior to their EOI submission. The lowering of the pass mark will enable more immigrants to be eligible to apply for an Australian visa. Once the new SkillSelect system in implemented, SkillSelect will begin issuing invitations to eligible applicants in August 2012. Invitations will be issued to the applicants with highest ranking EOIs in descending order. The date and time of submission of the completed EOI may be a determining factor when considering visa applications from people who score an equal number of points; Priority will be given for applications which are received earlier. Also, there will be a CAP on each occupation to limit how many people are selected from a certain occupation group. This makes it sure that the migration program is not dominated by a narrow range of occupations. The change is encouraging for applicants in view of state sponsorship as when an applicant’s application is lodged through Expression of Interest (EOI) under subclass 190 or 489, may also help some applicants that will now qualify for state sponsorship who previously wouldn't have had the eligibility. This notice would be of particular importance for applicants who require additional points due to having less points for IELTS, age and or work experience. Also, there has been a change in the update of Business Skills Program Reforms effective from 1 July 2012. Interested applicants who wish to process their application for any one of the above visa categories and meet the requirements, can contact Bilimoria & Associate. We will be happy to assist you on the Immigration process towards obtaining your Residence visa to Australia for you and your family. Please call our office or write to us to assess your eligibility. Bilimoria & Associate liaises with a company which is one of the oldest migration agencies in Australia and has 4 Registered Representatives / Agents plus support staff towards preparation of a successful application. The Principal is a Registered MARA agent and has many years of experience, including with the Australian Government. The representatives / agents are all members of the Migration Institute of Australia and strive to achieve the highest possible standards of professional service. Bilimoria & Associate’s mission is to enable prospective immigrants to take advantage of Australia's strong economy and urgent need for skilled and business migrants who can expect to enjoy a high standard of living, excellent educational facilities and real Quality of Life. Family - Parents, Aged Dependant Relatives, Carers, Dependent, Orphaned or Adopted children, Last Remaining relatives. If you are interested in migrating to Australia, please fill out the Assessment form which is found in our website and we will assess your eligibility and advise you how to proceed further. We work with members who are members of Migration Institute of Australia (MIA) and Migration Agents Registration Authority (MARA) Representative and strive to achieve the highest possible standards of professional service. Kindly forward us your detailed resume to neville@bilimoriaassociate.com for us to assess and advise on your eligibility, or call our office on +91 44 2822 7222 / 2823 9229 / 4350 8191 during Business Hours: Monday to Saturday: 10.30 am to 5.30 pm (Lunch: 1.00- 2.00 pm) for consultation or for an appointment.